On Becoming an Intern Things recent graduates should know. Selecting a Recital Venue Choosing an affordable, safe theatre that meets your technical needs. How to Work with a Lighting Designer How to communicate effectively with your lighting designer. Stage Management 101 Lecture notes from teaching stage management at the college level. 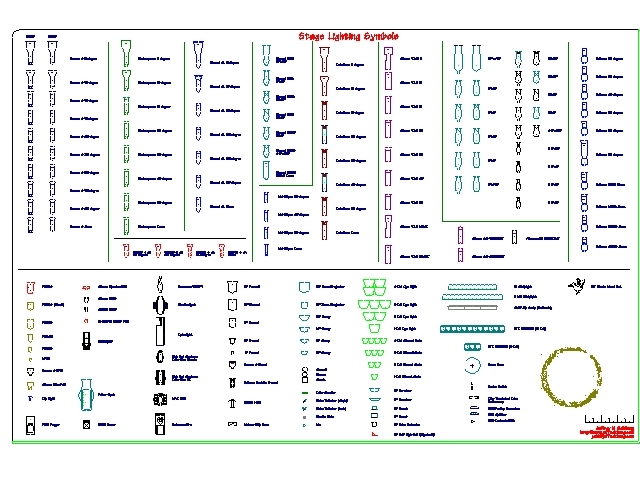 Photometrics Spreadsheet Excel spreadsheet to calculate field width and intensity for most commonly-used stage lighting fixtures. In .MCD (Vectorworks Version 10) format Symbols for common theatrical fixtures (as well as the ever-popular vodka bottle and coffee ring; email if you'd like the chicken), for importing into your CADD program of choice. Vectorworks file courtesy of Joe Golden. Joe Golden's blender library in DXF* Format Symbols for 19, 26, 36, and 50-degree blenders. * Some browsers may attempt to open DXF files as text files in a browser window. If this happens, right-click the link, save the file to disk, and open it with your CADD program.